Thanks so much! Yeah, Loki can be a nice guy, especially around his wife and kids. <3 Next page is especially mushy! Ahh! Yay, more adorable Loki! I really like how, so far, you’ve shown Loki’s good side rather than his bad side. He’s one of my favorite gods and it can get annoying always seeing him as the bad guy. I’m really loving the tone in the first panel. Thanks! I had a bit of a time figuring out how to make it look the way I wanted but I’m happy with the results. 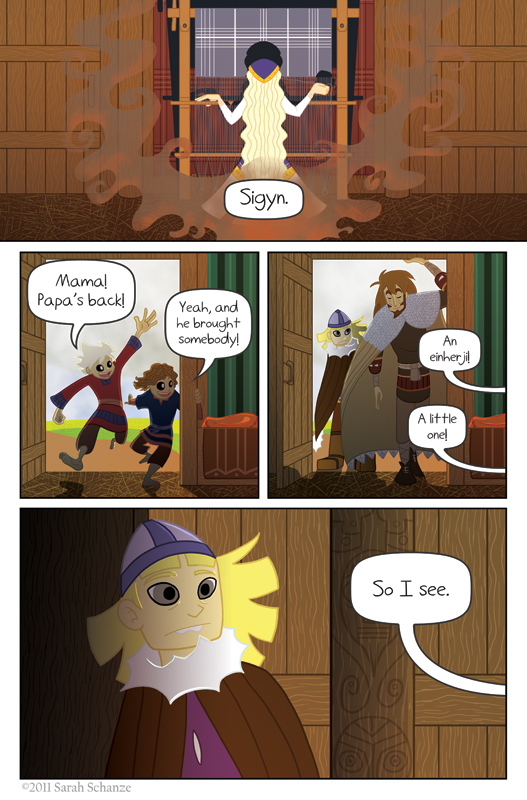 I think that second pannel is my favorite that I’ve seen thus far; the running through the door is so animated! Zoom! Haha! Yeah I like those poses to. Everyone else is so sedate, it’s fun to draw characters with more enthusiasm in them. She’s making a tapestry, or a blanket. I’m not sure what looks weird about it? I dunno what sort of patterns they really used so I just did it based on an educational viking book I had. These panels are just sublime! The next best thing would be to see all these great character designs and color palettes in action! Your pages always look like lovely screencaptures! Can’t wait to see Sigyn! Hahaha! I’m glad you’re enjoying Loki! XD And Narvi’s arm isn’t really going through the wall, he’s gripping a post (the post that’s next to Coal in the last panel). It’s hard to see, so I’m not really surprised it looks like that. Maybe hopefully in future pages it’ll be easier to figure out the layout of the house. Over all, though, Isis is my favorite of all the pantheons, which my friends find amusing since Loki’s in my top 10. Hey, love your comic. Loki has always been my favorite, though I admit I can’t remember much about the Norse mythology. It may look different to people viewing on a decent diced screen instead of a phone, though. Anyway, great comic, love it. Keep on keepin on and do what you do. Oh, and baby Coal is adorable! Haha! Well, Sigyn isn’t a goddess, but she’s a very good weaver. XD Thanks! Awwwwwwwwwww. While I do enjoy that second panel, I must say I love the third the most. Just the way Loki holds himself and walks through the door… <333333 Sort of like a yes, yes I am back. I brought a cranky little guy with me! But it's ok, 'cause you love me. XD I dunno, it made sense in my head. Loving the comic though. And how Narvi is running so fast he uses the pole-thing for leverage to not skid across the floor (which I can see and is hilarious in my head) and instead fly into the room. the more i read this comic, the higher up my rank it goes. the only one i read regular that is better, is girl genius. you’re a closing second. 😉 i like the thor’sday update idea, but once a week, isn’t enough. I agree it’s not enough, but there’s nothing I can do about it right now. I hope you continue to enjoy the comic regardless. Thank you! Love the panel of the two boys jumping into the house. So dynamic!